The main character is attending HS. Main Character is an Ex-Teen angel. Thanks for the back story. I learned that he is in love with a mortal girl. 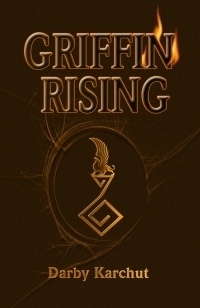 I learned that Griffin is part of an apparent series and that book two is Griffin's Fire. A new book called finn finnegan by this author will be coming out later this year. Griffin is certain of one thing: the only way to fight a Cold War is with Fire. I learned that it has a lot of good reviews! It's also called Griffin Rising Book One: Earth. They take on father and son identities, interesting! The Supernatural being have the power to control Earth Wind Fire and Water. He was a teen angel. Griffin has been banished from the Terrae Angeli. National Children's Book Examiner gave it 5 stars and this is the 2nd book in the series! I learned that Griffin is an angel-in-training. I learned book 2 in this series is Griffin's Firse.